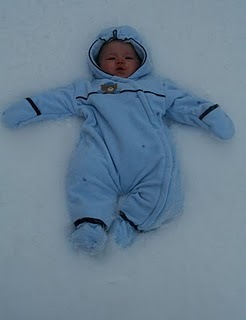 What’s the point of having snowsuits if they can’t spend a few minutes in the snow? I resisted the urge to bury them in snow because it is very cold, and they were only outside for a few minutes. Wyatt held still as the snowflakes fell on his face; perhaps hoping it would all go away if he didn’t move. Ruslan made no secret of his dislike for this outing, but stop crying as soon as I picked him up. TOO CUTE! 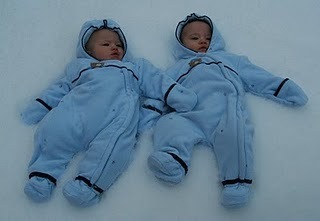 Both the snow suits and the babies! 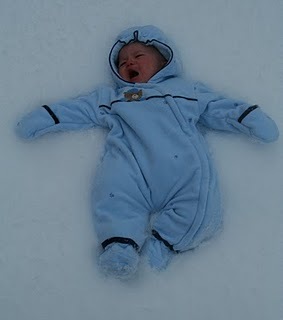 My first hated the snow PASSIONATELY. Two and Three love it, Four seems to despise it, too. Kids are weird, lol! Ohmygosh! 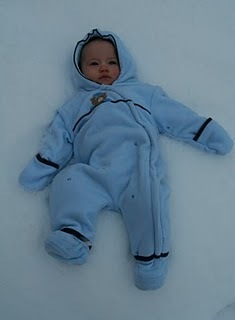 I love the little snowsuits. They are ADORABLE! So cute!! Peanut has started trying to catch snow because he saw Little Bear doing it on Nick Jr. Except it doesn't look like catching so much as it looks like he's doing jumping jacks.